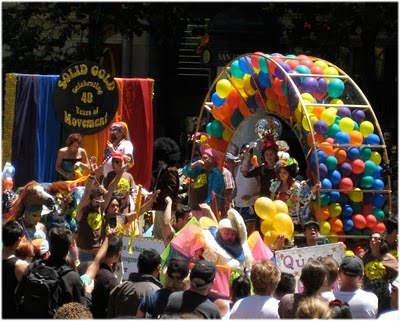 Went to my first Pride Parade here in San Francisco. I've lived in San Francisco a long, long time - okay, almost 30 years - and never attended. Well, I don't like large crowds. That's my big excuse. This year, I wanted to take pics with my little digital Canon. Its not a new camera. Its almost 2 years old. Somehow I am now inclined to record as much as I can of San Francisco living. I want to show friends, family what this beautiful city looks and feels like. Thanks to social networking, I've reconnected to cousins, old friends from UCSB and even my Italian "famiglia" in Torino. So there you have it. My camera stays with me - always. You never know what photo op I might happen upon. So, I'm including a link to my latest pics from the pride parade. It was a visual feast! Estudio Martita now on Latin Pop Shop! I am now one of the artists on the online gallery, Latin Pop Shop. Owner John Gascot says:"Artist-created, Latin Pop Shop is a brand new online retail gallery specializing in Latino, Latino-American and Latin-themed arts and handmade gifts. LPS is committed to supporting the growth and preservation of Latin culture by way of promoting creative Latino and Latina individuals, fairly, in an effort to help them make a living doing what they love and are naturally gifted at." I'm thrilled to be a new featured artist on Latin Pop Shop! Artwork on display at new San Francisco restaurant! Some of my artwork is on display in Noe Valley, in the neighborhood's newest restaurant - The Little Chihuahua. 4123 24th St. between Castro and Diamond in San Francisco. Stop by for good views and good eats! At The Little Chihuahua, our goal is to make delicious, healthy, Mexican-inspired food, while at the same time, make choices that help protect our Earth. Worked this weekend on a new artist statement and wanted to share it with all of you! My Mac is sick. What a DRAG!! Took it in to Mac Docs who said it would cost somewhere around $800.00 to be fixed. Right. Well, it looks like I might someday be able to replace it with a newer, used Mac but first all the other bills have to be paid. In the meantime, I'm using a p.c. 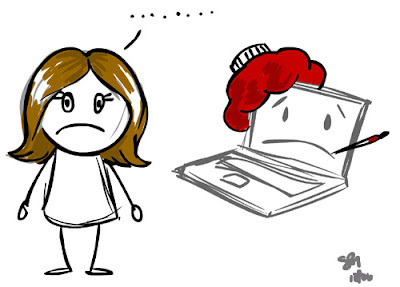 and feeling like a novice, missing all my FAB applications - especially Photoshop, Grab and IPhoto. Woe is me!!! Haven't figured out where to put my photos (hate Picasa) and haven't figured out how to use my scanner on a p.c. I'm a novice again with a bit of carpal tunnel. This is oh so alienating and just so WRONG!! Sunday at the Temescal Fair was a whirlwind affair. Lots of people. Beautiful day on Telegraph. Everyone seemed thrilled to be out, listening to music, doing some shopping. Met some new people, visited with friends and enjoyed the ambiance. Thanks to friends that came out to say Hi and visit. 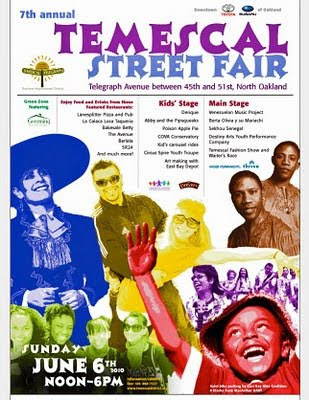 Just a reminder to stop by for a visit at the Temescal Street Fair in Oakland.